State of the art vehicle safety technology and innovation is constantly improving vehicle and on-road safety. CVMA member companies are committed to enhancing the safety of vehicles through development and delivery of world-class advanced safety technologies across a wide range of vehicles. Motor vehicle safety standards in both Canada and the US are among the most stringent in the world. Our automotive industry is highly integrated on a North American basis as is our economies. Ensuring a regulatory framework that supports the ability to manufacture a product that can be sold and certified once across the North American market provides greater efficiencies for manufacturers and real safety benefits to consumers. Canadians benefit from the acquired economies of scale which provides more ready access to the most sophisticated, world class technology and exhaustively tested vehicles, with greater vehicle choice at an affordable price. Significant advances in safety technology have been made both voluntarily by industry and in response to government regulation. The introduction of advanced vehicle safety technology has been a primary reason for significant reductions in severe occupant injuries and fatalities across Canada. In fact, over the past 40 years, the number of occupant injuries and fatalities have been reduced by a factor of 3 and on a continuous basis despite a doubling of the population. Vehicle manufacturers are continually innovating and developing new safety system technologies and refining existing technologies to assist drivers before, during, and after a vehicle crash. 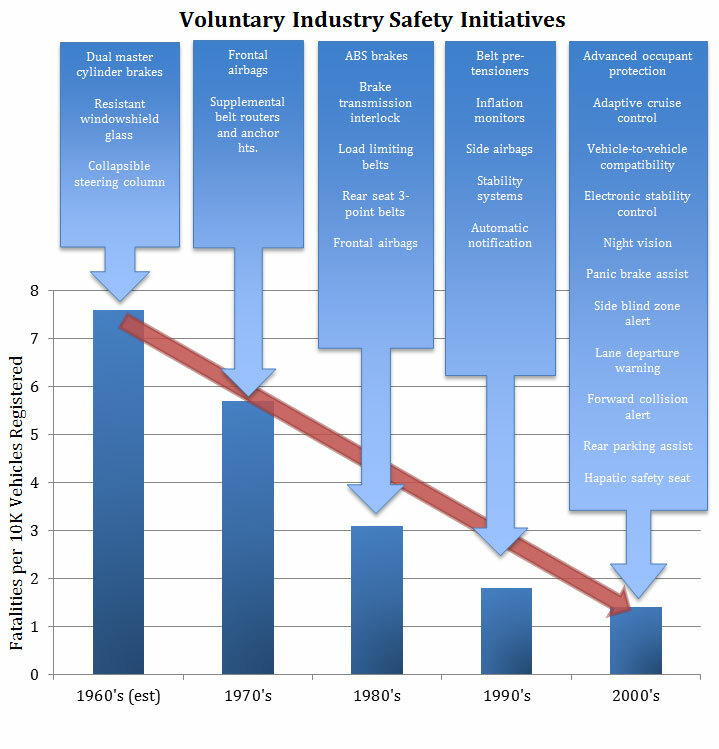 The auto industry continues to develop world-class safety features involving engineering analyses, extensive computer modeling, and vehicle crash testing to evaluate the performance of vehicle and its individual components. State-of-the-art computer simulations have been statistically correlated and validated to physical testing allowing accurate and detailed study of the dynamics of vehicle and occupant interactions during a collision. The knowledge acquired is used to facilitate the development and faster introduction of improved safety technologies in vehicles. Every 1 assembly job generates 7 to 9 additional jobs in the economy.